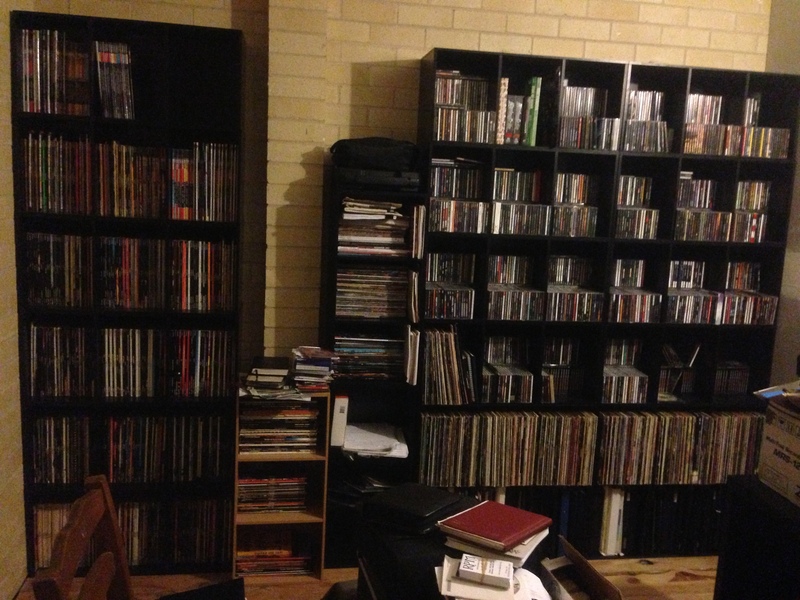 This is my record and CD collection along with the issues from Guitar World from January 1986. My kids have all of this on their iPod’s and iPad’s. I took the kids to the “Record Store Day” two days ago. – the line up/wait to pay for our purchases compared to clicking a few keys and having it all happen instantaneous. – the chance that what I wanted to buy at the Record Store Day could not be there or it could have sold out compared to having the history of music available at your fingertips without any issues. For the record, it was the last copy of the “Killers and Kings” single and the second last copy of the “The Illumination Theory” picture LP. – that once they found a record that had a cool cover from an unknown act, they couldn’t hear it BEFORE they decided to buy it compared to what they do on-line with YouTube and Spotify. 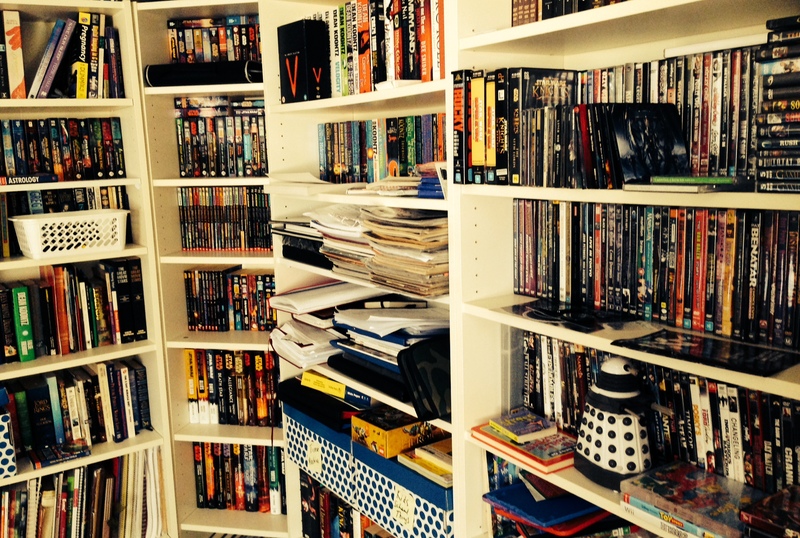 – the price of the special edition releases. 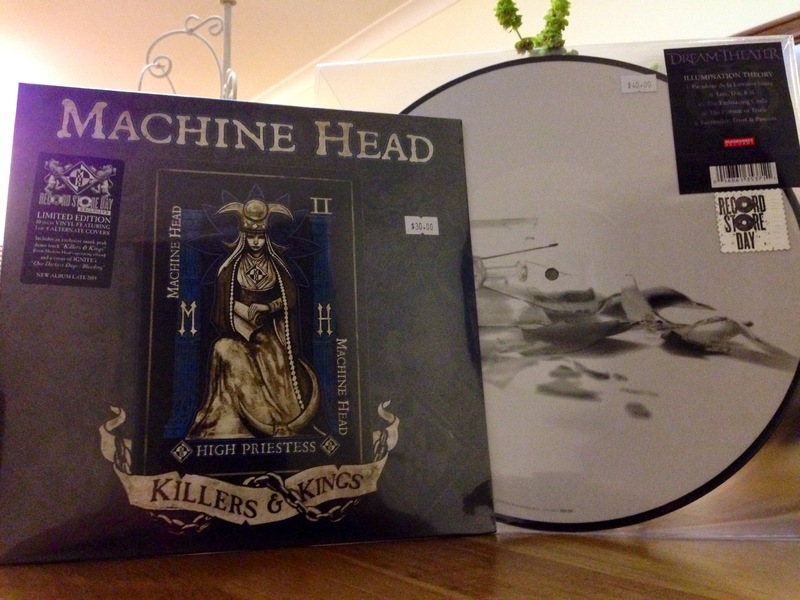 As a hobbyist/collector I paid $30AUS for the Machine Head “Killers and Kings” single and $40AUS for the Dream Theater “Illumination Theory” picture LP. My kids thought I was insane, spending $70AUS on two products, especially when a years subscription to Spotify is just a touch more and for that you get millions upon millions of songs. In other words, Physical books vs The Kindle Touch. If you are a business that is in the entertainment/arts arena that is still hoping on physical sales for profits, then your business model is challenged. I bet that comes to a shock to the traditional labels and marketing firms. The days of when music was only made available to people who had disposable incomes are over and have been for a long time. Music consumption is now being driven by different age brackets. The 113 million streams of Katy Perry’s “Roar” is being driven more by the kids in the 4 to 14 age bracket than the 25 plus adults. It is the song of the young, their anthem, their “We’re Not Gonna Take It”. It all reminds me of a song I once wrote called “Times Are Changing”. Guess the times are constantly changing and they are changing even faster in the era of the internet. And when I compare the new to the old, the times have really changed. The last band I was in didn’t jam. The drummer in the band wanted to hear a finished song with riffs and vocals before he even contemplated putting drums too it. So the way it worked was that I would put a song together and then on a working day, get together with the singer and the bassist to flesh out and finalise the melody. We would record that acoustic/vocal demo on one of those Zoom Handheld devices and then circulate the mp3 out to the drummer. 1.21 to 1.40 – Is the 7/8 time section. Listen to “Natural Science” from Rush. 1.41 to 2.05 – Is the next 7/8 time section. Listen to “The Masterplan” from Evergrey. On one hand I didn’t mind doing it this way, as I gave me a lot of control and on the other hand it bothered me. Because from jamming a lot of good musical ideas and progressions and performances could come out of it. It is those little musical nuances that make or break a song. You know when that riff you had in 4/4 just got better when it syncopated with the bass and instead of playing 8th notes constantly it developed some groove. Or that little hammer on and slide choice of notes coming out of the chorus and into the verse, just made that section flow better. Or that solo section building to a crescendo along with the beat. It is all of those little nuances that come up from jamming a song. Bob Daisley summed it up when he said that Randy Rhoads, Lee Kerslake and himself got the best performances out of each other. But then I thought about the band I was in before that. All we did was jam and record. It seemed like we had infinite rolls of tape. In one year we wrote 4 songs. The singer/guitarist at the time said quality over quantity. I argued back that quantity breeds quality by default. You try out all of the ideas and the quality ones will always stand up. What I had instead was a dictator saying either YES or NO to an idea. There are no happy mediums for all involved. Democracy in songwriting doesn’t work. Democracy in songwriting is like the Democracy in Australia (or the US or the UK). We believe that we have a say, however our Governments are ruled by the bureaucrats and the rich. Growing up with the MTV generation suddenly our heroes were everywhere and the focus on writing THE SONG to film an expensive video clip for, meant that the bands or artists would have two to three-year gaps between albums. And we have continued that trend well into 2014. Everyone still tries to write THE SONG or THE SONGS in some cases and then they surround THE SONG or THE SONGS with filler and call it an album. If you don’t believe me, name me all the tracks from your top 10 albums of the last two years. I guarantee you that you will fail. And with what we know now, we don’t want that album unless it is great from start to finish or unless it is part of a vanity concept story. Machine Head almost nailed the complete album with “The Blackening”. Go to Spotify and you will see that five from the top 10 most played tracks from their catalogue come from that album. If you add the two cover songs from Metallica and Iron Maiden, then that makes it seven. I also dig the fact that for “Unto The Locust” they had only seven songs on the album with four stand outs in “Be Still and Know”, “Unto The Locust”, “Darkness Within” and “Who We Are”. And from reading the blogs that Robb Flynn writes it is safe to say that Machine Head are a jam band with the final say sitting with him. That is why after Machine Head pressed the reset button on their career after “Supercharger” they have gone from strength to strength. They’ve jammed themselves into lifers and still dealt with the complexities that are bands. And there is no doubt about it, bands are complex and simple rules just don’t do anything to govern certain situations. Small businesses need to understand that life’s changing and because it is changing so fast, it is a case of adapt or die. To put it into perspective, the Australian Government recently signed a few Free Trade Agreements with South Korea and Japan, with China set to follow soon. All of this will make it easier for the big retail giants of those countries to enter the Australian market. All of these FTA’s makes it harder for small businesses to compete. Because as is the norm when big giants come into a market, prices go down, and for small businesses it does not make life easier, it makes it harder. However, opportunities always emerge for the fast adapters. Sort of like the music business. The ones that adapted to the changes fast, survived. While the ones that complained and whined about peer-to-peer either perished or downsized. Traditional music distributors. Gone or downsized. Replaced by Digital distributors. Record Store Retail Outlets. More or less gone. Replaced by online shopping carts, streaming and digital downloads. Publishing companies. Downsized or merged. Record Labels. Downsized or merged. Saved by the tech industry. Bands. Either are breaking up or are constantly replacing members. So if small businesses needs to adapt to survive on a constant basis, than artists, record labels and the music business in general should be no different. And just because the recording business was dragged kicking and screaming to embrace mp3’s, then YouTube and then streaming, the innovation doesn’t end there. Adaption is the key. Instead, the music business is cashed up and the record labels have a powerful lobby group that instead of innovating and adapting to the changes, they lobby hard to have laws passed to assist them. Instead of adapting, they have the courts step in to assist them. Instead of innovating, they had the Federal Police step up to the plate and assist them in using terrorist style raids on unsuspecting victims, like a 5-year-old girl and her Winnie The Pooh laptop. And now that the recording business is all in with the techies, those same techies now have shareholders and boards that want profits first and innovation second. Seen the stocks of Netflix, Facebook and Twitter recently. But tech is where the action is I hear people say. Well I say tech is where the action is up until profits trump innovation. Music drove culture up until a point in time in the mid Eighties when executives put profit margins ahead of music. And in business, cash flow is everything. In music, cash flow is a byproduct of great music. In music, rules are meant to be broken. Innovation is about breaking the rules. New musical legends will combine both and rise from the ashes to enrapture the public. And they will be different. These artists will not be interested in corporate deals and sponsorships. These new artists will not be concerned about the past. They will be concerned about changing the future. With music. Like it was once before. When music led the way.